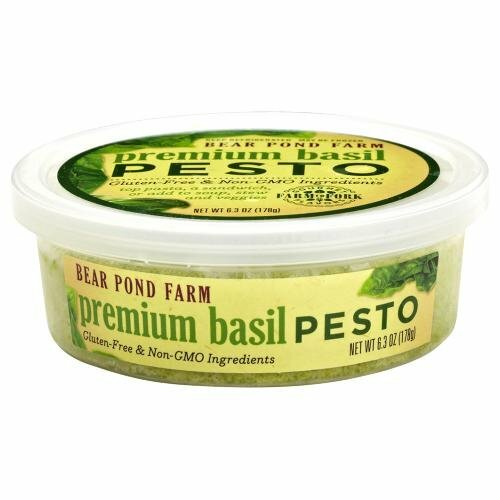 Bear Ponds Premium Basil Pesto is silky and sublime, made with organic basil, non-GMO canola and extra virgin olive oil blend, Pecorino Romano cheese, garlic, organic Kaliteri and Mintucha oregano blend and more. The All Natural, Artisanal Gourmet Pestos ingredients are grown at Bear Pond Farm, a small certified organic farm in Connecticut. These amazing pestos are nut-free, though they are made in a facility that does process peanuts and tree nuts. You can freeze and re-freeze these gourmet pestos; no waste, no spoilage. Just microwave them on low power with the lid ajar so that they will vent; in order to warm them to just room temperature. Once thawed you can keep them for 30 days in the refrigerator or refreeze them. It all began at a New York City green market, where Bear Pond Farm once sold heirloom veggies and herbs to discerning buyers. Today, Bear Pond Farm cultivates basil, rare Sicilian mintucha and Greek kaliteri oreganos, rosemary, mints, French sorrel and lemon verbena on the East Coast and also operates a certified organic farm in Northern California in order to process several of their rare herb varieties during the winter season. The Nibble online e-zine selected the Bear Pond Farm pestos as their silver award winner from the New York Fancy Food Show in 2007. Use these vibrant pestos in your pasta sauces, on your pizza, your sandwich or even as a dip sauce.